Here's a warning to us all. The image above is fascinating. The gold cuffs, brass cannon, red breeches, and a whole lot of other details make this image remarkable, but the real treasure was that it featured a black sailor. There are precious few primary source images of sailors of African descent, and certainly none of them are as well dressed and significant looking as this. For that reason this portrait is roundly referred to as the "Black Admiral." Identified as an unnamed sailor during the American Revolution, this portrait appears in countless websites, textbooks, and other sources. In 2006 the "Black Admiral" was brought to Fraunces Tavern for an exhibition, where a painting restoration expert was brought in to clean it. 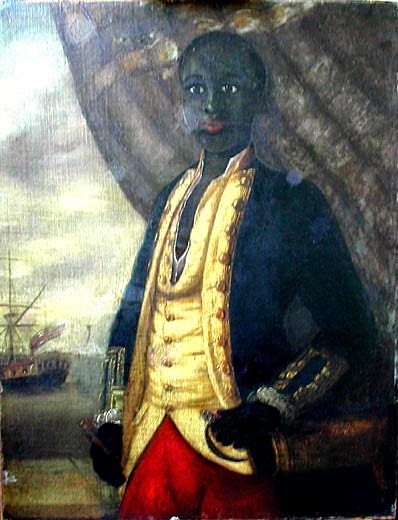 His suspicions were raised at the mere sight of the portrait, and he quickly confirmed that it was a white naval officer who had been painted into a black sailor sometime in the mid-20th century. This verified forgery is still being passed off as authentic on many websites and in many books. Always be cautious when judging the source of your images!